DODGE CITY, Kan. (Reuters) - Clemente Torres has proudly cast his vote in person at Dodge City's lone polling place in every election since he became a naturalized citizen 20 years ago. After Republican officials said in September they would move the Hispanic-majority city's only polling place to a remote spot outside the city limits, across railroad tracks and away from bus lines, Torres decided to vote by mail. "I wanted to be sure I could vote," said Torres, 57, who works at a meatpacking plant in this western Kansas city best known for its history as a Wild West outpost. "I didn't want to take any chances." Torres and other voters interviewed by Reuters said they were worried voting would be more difficult at the new location. Some were skeptical of the official explanation: that construction will hinder access to the usual site. The move sparked an outcry from voting rights groups that say Republicans are trying to limit Hispanic votes. The American Civil Liberties Union asked the courts to force Dodge City to open another polling site – a request denied by a judge on Thursday. Democrats are mobilizing to rent vans, line up volunteers to drive people to the polls and set up a hotline to ask for rides. Kansas is just one front in a broad national struggle over voting restrictions passed by Republicans, who say they are needed to combat voter fraud. 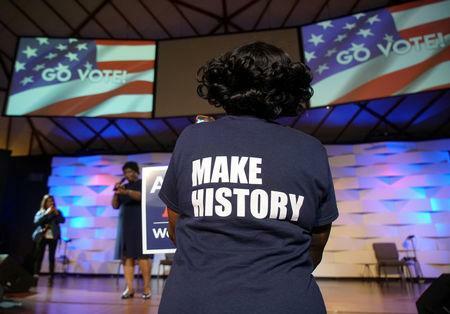 Democrats and advocacy groups are scrambling in courtrooms and on the ground to resist efforts they say will stack the deck against minority voters likely to back Democrats in next Tuesday's elections, where control of the U.S. Congress will be at stake. The national voting rights debate, which accelerated after the U.S. Supreme Court struck down parts of the Voting Rights Act in 2013, has been particularly intense this year in states with tight, high-stakes election races such as Kansas, Georgia, North Dakota and Tennessee. "There are a lot of grim things happening, but people are awake and highly engaged to fight back on this issue," said Leah Aden, deputy director of litigation at the National Association for the Advancement of Colored People's Legal Defense and Educational Fund. 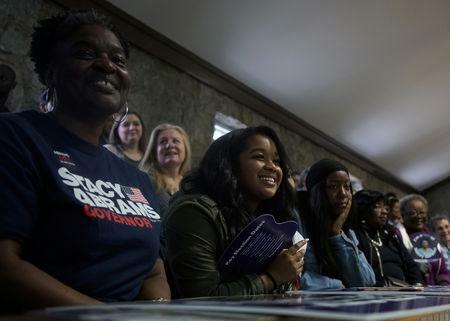 On a recent afternoon in Dodge City, where about 60 percent of the 27,000 residents are Hispanic, many of the mostly Hispanic workers pouring out of a beef processing plant during a shift change were surprised to find a trio of Kansas Democrats waiting for them. "Do you know your polling place has moved?" Democratic congressional candidate Alan LaPolice asked as he and two aides handed out more than 300 packets with bilingual information on where to vote and how to call for a ride to get there. Alejandro Rangel-Lopez, 18, a first-time voter in November and a plaintiff in the ACLU lawsuit, said the new polling site would make it tough on people unable to get time off from work to vote, or had transportation or language issues. "People can't just leave the plants to vote. You can't just run over on your lunch break," Rangel-Lopez said. Suspicions about the motive behind the polling place change come naturally in Kansas, where Republican Secretary of State Kris Kobach, one of the country's foremost advocates of restrictive voting and immigration laws, is in a tight race for governor against Democrat Laura Kelly. "This is a slap in the face to voters here," said Ford County Democratic Party Chairman Johnny Dunlap. "They should be making voting easier, not harder." Debbie Cox, the Republican county clerk who ordered the move, declined requests for comment on her decision to set up a new polling place about 4 miles (6 km) from the old one. But the state's elections director, who works under Kobach, said Cox chose the best available alternative with adequate parking and space. "I have trouble understanding how this was voter suppression. There just weren't many options for polling sites that fit the criteria," Kansas Elections Director Bryan Caskey said. "I can say with 100 percent certainty that Secretary Kobach had nothing to do with this." Kobach has relentlessly promoted theories about the threat of voter fraud and was a leader on President Donald Trump's disbanded election integrity commission formed to look into possible fraud in the 2016 election. While Republicans say new voting restrictions such as tougher ID requirements and aggressive voter-roll purges are necessary to ensure honest elections or clean up voter rolls, independent studies have found that voter fraud is extremely rare. 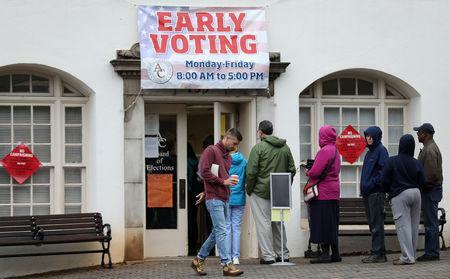 Other states with major election races also have wrestled with voting rights issues. In North Dakota, where Democrat Heidi Heitkamp and Republican Kevin Cramer are in a close Senate race, Native American tribal leaders have mobilized to help up to 10,000 residents in rural reservations whose voting eligibility has been threatened by a state law requiring a residential street address on ID's. Many reservation residents use post office boxes for mail delivery and do not have street addresses. The law, which Republicans said was aimed at fighting voter fraud, was passed after Heitkamp was elected to the Senate by fewer than 3,000 votes in 2012 with strong Native American support. Precinct maps and satellite images of the state's five reservations are being used to help generate street addresses, which can be recorded and printed on tribal letterhead, said O.J. Semans, co-executive director of Four Directions, a Native American voting rights group. "This is about being pushed into a corner and having to fight back," Semans said. "We want to make sure the state thinks twice about doing something like this again." Groups in Georgia sued to block Democrat Stacey Abrams' opponent for governor, Secretary of State Brian Kemp, who is also the state's top election official, from throwing out more than 50,000 voter registration applications put on hold under the state's "exact match" law requiring personal information on voter applications to match state databases. The lawsuit alleged the vast majority of the disputed applications were from black voters. Jimmy Carter, a former U.S. president and Georgia governor, even weighed in, calling on Kemp to resign his post supervising elections. Kemp has refused to step down and says he is fairly applying Georgia's laws. In Tennessee, home to another crucial U.S. Senate race between Democrat Phil Bredesen and Republican Marsha Blackburn, a lawsuit by voting rights groups led a judge to order that people in majority-black Shelby County be allowed to fix their incomplete voter registration applications and vote. Democrats in Tennessee have formed the first statewide voter protection team to watch for problems at the polls. Tennessee Democratic Party Chairwoman Mary Mancini calls them an "army of poll watchers."